"God is a concept by which we measure our pain," John Lennon sang. Or to put it another way, in the movie Corrina, Corrina when a little girl tells her dad that her mother is in heaven with the angels, he says, "heaven, the angels, and all that, it's just something people made up so they won't feel sad anymore." And the child responds, "well, what's wrong with that?" The answer, of course, is that what's wrong with that is when people try to force their religious beliefs on others, and are intolerant of any other beliefs. But here in America, we have something called the separation of church and state which ensures this can't happen. Don't we? It's getting a little hard to tell these days. 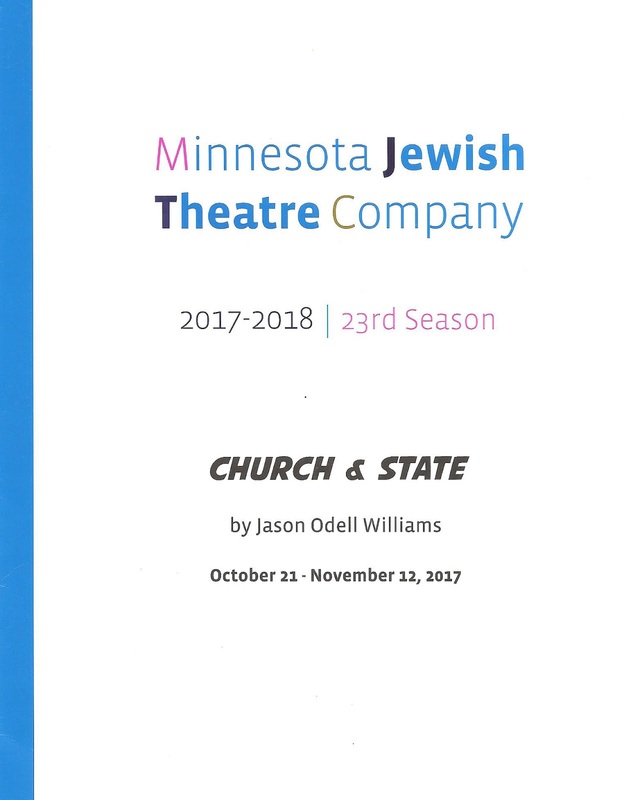 But in Jason Odell Williams' new play Church and State, making its #TCTheater debut at Minnesota Jewish Theatre Company, at least one politician still believes that, and isn't afraid to say so. 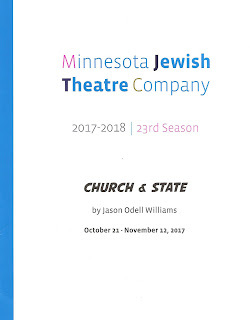 Church and State is funny, smart, thought-provoking, sobering, and short, and MJTC has put together an excellent cast that makes this an entertaining, if a bit depressing, evening of theater. You know it's fiction when a Republican senator gets re-elected in North Carolina just a few days after saying he's not sure he believes in god, and calling for reasonable gun laws. 'Cause that would never happen. But it does for Senator Charlie Whitmore, with help from his supportive Southern wife Sara and New York liberal Jewish campaign manager Alex. At a funeral for children killed by gun violence, Charlie confesses to a blogger that he doesn't turn to prayer in times like this, because the victims need action more than prayers, and what kind of a god would let this happen anyway? The story breaks just before a pivotal speech, and despite Sara and Alex's protests, he goes off script and expands on the idea. Somehow this doesn't end his career, but instead gains support from both sides and he wins with 71% of the vote. It's election night, and we're celebrating, but that's not the end of the story; not everyone is quite so happy with his speech and re-election. Under director Michael Kissin, the four-person cast is fast, funny, and natural, often talking over each other in the way that people do in heated conversations. Matthew Rein is strong and believable as the conflicted politician, Miriam Schwartz is perfectly cast as his smart campaign manager, and Josh Zwick steals scenes as several different characters. But Kim Kivens as the politician's wife has the juiciest role here, going from shocked and dismayed at her husband's confession, to drunk and happy (seriously, Kim Kivens playing drunk is comedy gold), to sober and deadly serious in the course of 80 minutes, and she does so flawlessly. It's overall a great ensemble that works well together. 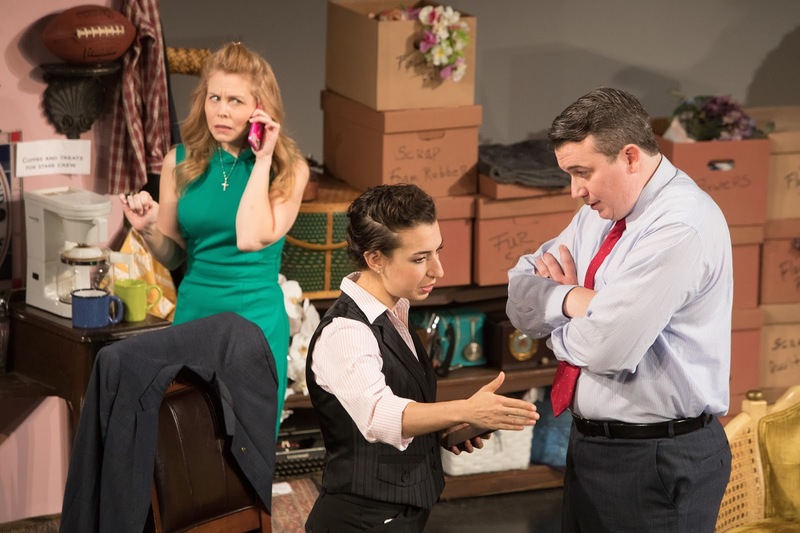 The play takes place backstage at a theater where the senator is giving his speech, but with all the eclectic props it looks more like an antique store or thrift shop. There's lots of fun stuff to look at that doesn't really have anything to do with the play, and in fact creates a nice contrast to the political talk. Characters are dressed in polished suits and sharp dresses appropriate to their roles (scenic design by Kirby Moore, properties design by Bobbie Smith, costume design by Barb Portinga). I take it back, this play isn't depressing, it's hopeful. Reality is depressing, and often seems hopeless. I saw this play on the 15th anniversary of the death of Paul Wellstone (talk about the death of hope), and on the day when everyone was talking about Jeff Flake, a Republican senator I'd never heard of before, but who seems to be someone willing to stand up for what's right despite what those in power say. But because this is reality, he's not running for re-election to win handily with 71% of the vote. He's not running at all, because he can't win in the real world as it exists today. If you long for a world where politicians care about their constituents and making the country, the world, a better place, turn off the news and go see Church and State (and then call your representatives and vote!). Continuing through November 12 at Highland Park Center Theatre.